@Ventspleen2014 shows his funny side and explores the horror comedy Tucker and Dale Vs Evil. Horror and Comedy have shared screen time for decades. I have been a fan of the Abbott And Costello meets (Dracula, The Mummy etc) ever since I've been a small boy. I think the feelings of fear and humour are so closely linked its why when suddenly shocked the default reaction is to laugh. Film company floors are littered with Horror (SLASH) Comedy films that haven't been either funny or horrific. (Scary Movie Franchise, Dracula- Dead and Loving It etc) Move too far into comedy and the film descends into free fall so the level has to be expertly fixed. The Horror genius that is Wes Craven got this level spot on with Scream, but then you'd expert that of a Master Craftman like Craven. He understood the genre so well that he could produce an effective horror whilst including elements of comedy intertwined within the story. Eli Craig chose this genre hybrid as the focus of his first full length feature as Writer/Director. Obviously, he doesn't like setting himself easy tasks and the job of being both Writer and Director is hard enough alone. Potentially too familiar with you material, how many times have you watched a film and felt it was a total washout due to poor writing and poor direction? There is simply no reason to worry with Tucker and Dave Vs Evil. It is a glorious example of knowing horror and bristling dark comedy. Playing very much on the oft worn trail of Red Neck Hillbilly cannibal types (the ones you see eating manwiches in Wrong Turn) but gives it a glorious twist. Actually, Craig plays on this knowledge not just with the audience but with the young college kids that frequent them there woods. Allison, Chad, Chloe, Chuck, Jason, Naomi, Todd, Mitch and Mike are going camping in West Virginia. On their way to the camping site they stop for supplies at a local store and bump into Tucker and Dale. 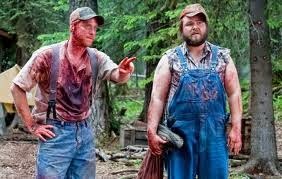 Due to a misunderstanding and the groups belief that they will be attacked by locals, they view Tucker and Dale as murderous Hillbillies. The bloody action that ensues is caused by this misunderstanding and its hilarious! Standout scenes include Tucker trying to explain to a local cop why he has mulched one of the kids in a wood shredder ("he just jumped in there) and when Dale "chases" after the fleeing group when in actual fact he is being attacked by bees. Craig expertly plays on stereotypes and gender roles with an exceptional eye for detail, whilst at the same time telling a genuinely original horror story. If only all horror comedies were handled with this sort of expertise, we would never have to sit through something like Repossessed again! You can watch Tucker and Dale Vs Evil with us this Sunday at 9pm BST and purchase a copy here from Amazon.